Most of the modern nation of Turkey occupies the broad peninsula of Anatolia (Asia Minor) between the Black Sea and the Mediterranean Sea. The northwestern corner of the country is the region of eastern Thrace, a part of Europe adjoining Greece and Bulgaria. Between Anatolia and Thrace is the small Sea of Marmara, connected to the Black Sea by the Bosporus and to the Aegean Sea by the Dardanelles. These narrow passages form a famous international waterway, lit by several historic lighthouses, connecting the Black Sea to the Mediterranean. 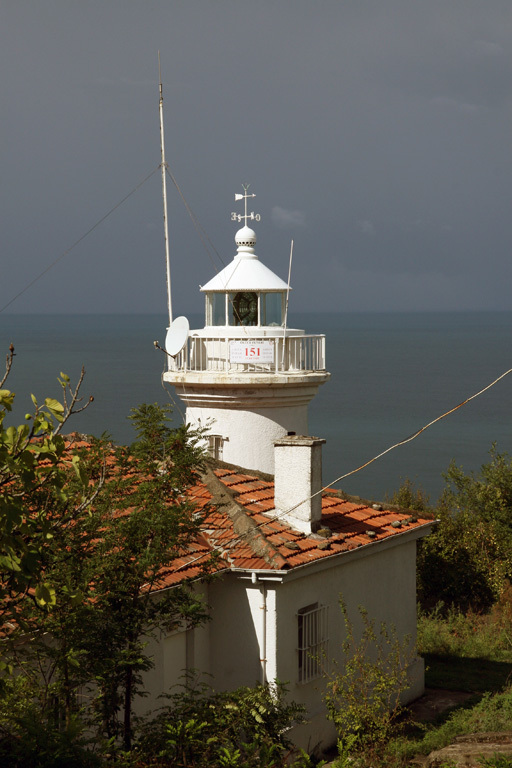 This page describes the lighthouses of Turkey's Black Sea coast in Anatolia, that is, east of the Bosporus entrance. 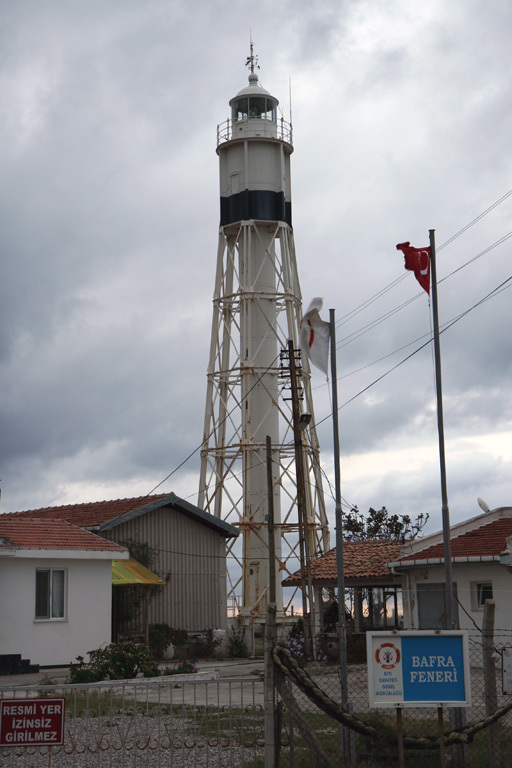 The Turkish word for a lighthouse is fener (plural fenerler) or deniz feneri ("sea lantern"). Burnu is a cape or headland, ada or adası is an island, and limani is a harbor. 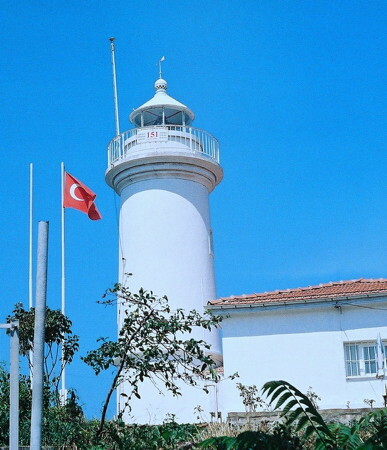 Lighthouses in Turkey are operated by the Directorate General of Coastal Safety (Kıyı Emniyeti Genel Müdürlüğü). ARLHS numbers are from the ARLHS World List of Lights. TR numbers are Turkish light list numbers as reported by the Admiralty. Admiralty numbers are from volume N of the Admiralty List of Lights & Fog Signals. U.S. NGA List numbers are from Publication 113. Lighthouse information posted by the Directorate General of Coastal Safety. Photos of 22 lighthouses by Haluk Özözlü. This page by C.W. Bash preserves a series of small photos formerly posted on the Directorate General's web site. Date unknown. Active; focal plane 43 m (141 ft); white flash every 5 s. 8 m (26 ft) round concrete tower topped by a white tripod. Trabas has a photo, and Bing has a satellite view. Located atop a sharp promontory west of Sahilköy. Site status unknown. Admiralty N5833; NGA 19688. Date unknown. Active; focal plane 13 m (43 ft); red flash every 3 s. 8 m (26 ft) round white concrete tower. Trabas has a photo, and Bing has a satellite view. 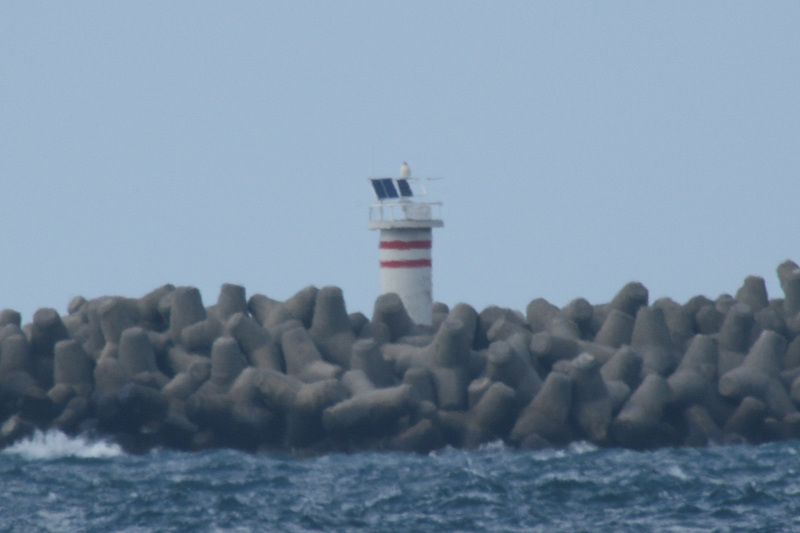 Located at the end of the north (main) breakwater of Şile harbor. Accessible by walking the pier. Site open, tower closed. Admiralty N5832.4; NGA 19684. 1859. Active; focal plane 60 m (197 ft); one long (1.5 s) white flash every 15 s. 19 m (62 ft) octagonal stone tower with lantern and gallery, attached to a 1-story stone keeper's house. Tower painted white with narrow black horizontal bands. This is a staffed station, and the keepers still wind the mechanism rotating the light. A photo appears at the top of this page, and Trabas has a fine closeup; in addition, a 2005 photo, a black-and-white closeup photo, and a distant view are available, and Bing has a satellite view. 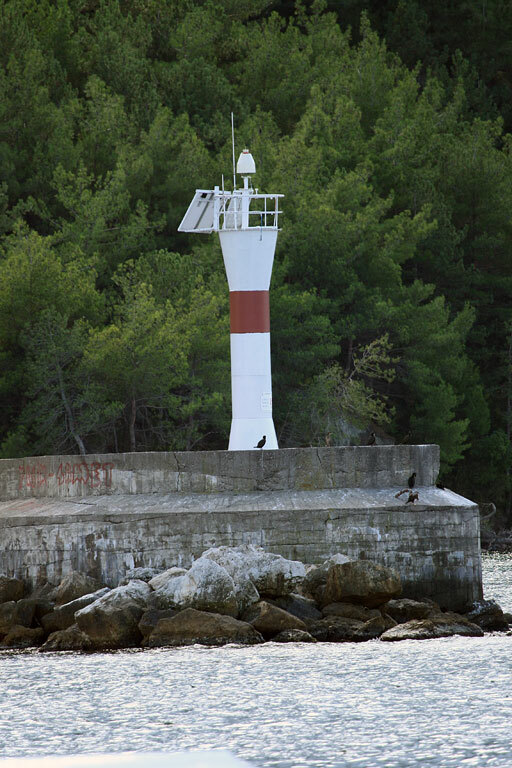 Michel Forand has a historic photo showing the lighthouse without the black bands. Cape Şile is the first prominent cape east of İstanbul on Turkey's Black Sea coast. Built by French engineers under contract to the Ottoman Empire, the lighthouse is one of Turkey's best known and most beautiful. The station has been designated a National Historic Landmark. Located on the point of the cape on the east side of the town of Şile. Site open, tower listed by the Coastal Safety Directorate as open to visitors. ARLHS TUR-046; Admiralty N5832; NGA 19680. Date unknown. Active; focal plane 7 m (23 ft); green flash every 3 s. 5 m (17 ft) round white concrete tower with a narrow green horizontal band. Trabas has a photo, and Bing has a satellite view. Located on a short breakwater at the entrance to the Yeşilçay River at Ağva, a resort town 38 km (24 mi) east of Şile. Site open, tower closed. Admiralty N5831.42; NGA 19678. Date unknown. Active; focal plane 7 m (23 ft); red flash every 3 s. 5 m (17 ft) round white concrete tower with a narrow red horizontal band. Trabas has a photo, and Bing has a satellite view. Located on a short breakwater on the north side of the entrance to the Yeşilçay River. Site open, tower closed. Admiralty N5831.4; NGA 19677. Note: Kocaeli Province also has a west coast on the Sea of Marmara; see the Northwestern Anatolia page for that coast. Date unknown (station established 1879). 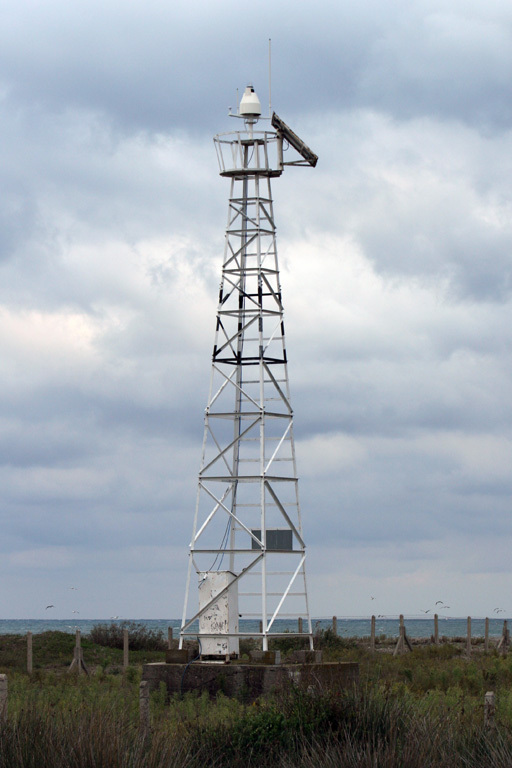 Active; focal plane 24 m (79 ft); three white flashes every 15 s. 10 m (33 ft) octagonal cylindrical white concrete observation tower with a flared top and double gallery. Fog horn (two blasts every 20 s). 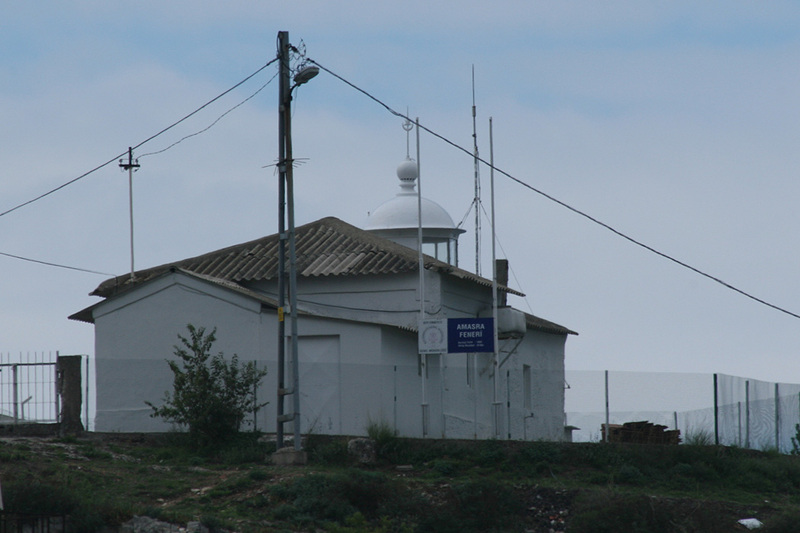 A Coast Guard station adjoins the lighthouse. A closeup photo is at right, Trabas has a photo, Özözlü has a distant photo (last photo in third row), another view from the sea is available, and Google has a satellite view. The history of this station is not well known; a 1920 light list describes the light as a 7 m (23 ft) metal column. One of the few islands on Turkey's Black Sea coast, Kefken is located off Kefken Burnu, a prominent cape about 50 km (30 mi) east of Şile. Site of a 14th century Genoese fortress, the island is a tourist attraction. Boat transportation to the island is available. Located near the west end of the island, overlooking the island's harbor. Site open, tower closed. ARLHS TUR-058; TR-10510; Admiralty N5830; NGA 19664. Date unknown. Active; focal plane 9 m (30 ft); white flash every 3 s. 8 m (26 ft) square skeletal tower mounted atop a square 1-story concrete equipment shelter. Entire lighthouse is white. Trabas has a photo, and Google has a street view and a satellite view. Located on the east side of the river entrance at Sakarya (not on the west side as listed by NGA). Site open, tower closed. Admiralty N5829.5; NGA 19660. 1863. 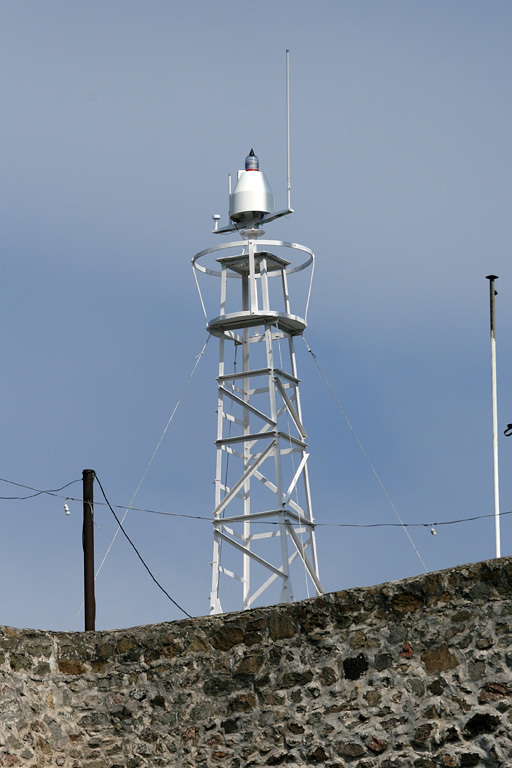 Active; focal plane 78 m (256 ft); two white flashes every 10 s. 9 m (30 ft) round tower, attached to the seaward end of a keeper's house. Lighthouse painted white. Trabas has a photo, David Lianez has a 2012 photo, Mustafa Kilic has a 2010 photo, and Bing has a satellite view. Located on Mount Kestaneci, a prominent cape about 3 km (2 mi) north of Ereğli. 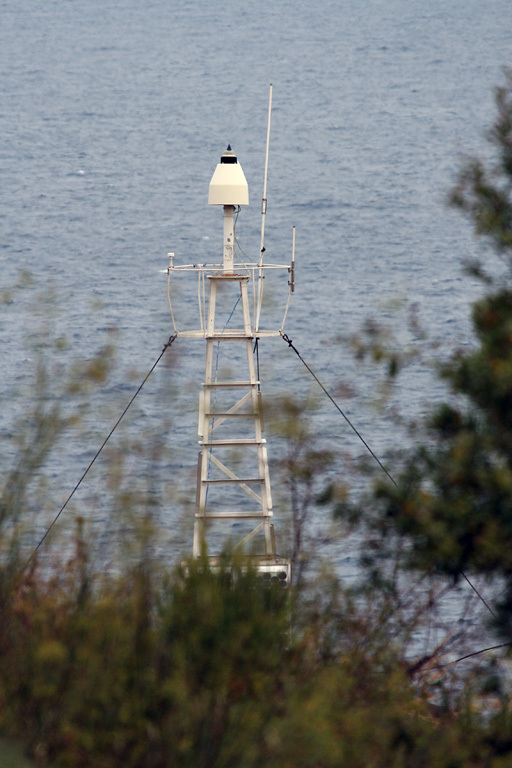 Site status unknown; Kilic's photo suggests that the lighthouse can be viewed from nearby. ARLHS TUR-044; TR-10470; Admiralty N5826; NGA 19632. 2002. 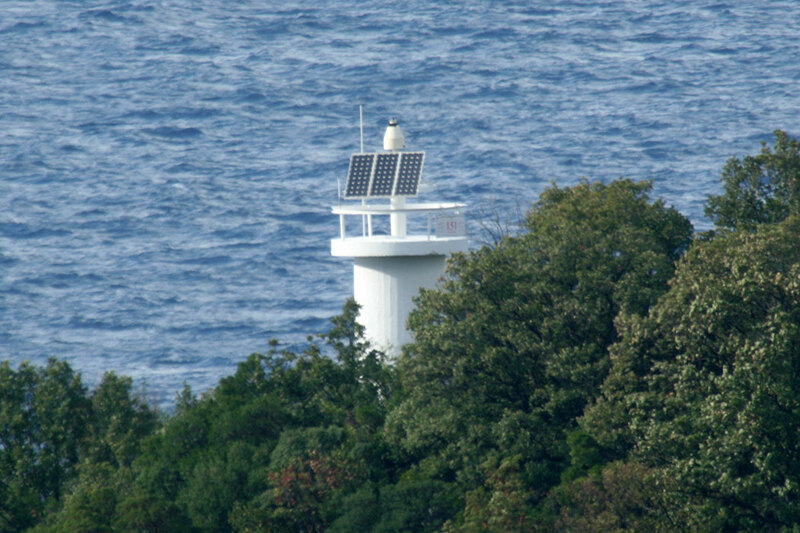 Active; focal plane 16 m (52 ft); green flash every 5 s. 10 m (33 ft) square skeletal tower mounted on a round, truncated conical stone tower. The tower is unpainted except the concrete gallery rail is painted green. Trabas has a photo, Bash has a Coastal Safety Directorate photo (1/4 the way down the page), and Google has a satellite view. 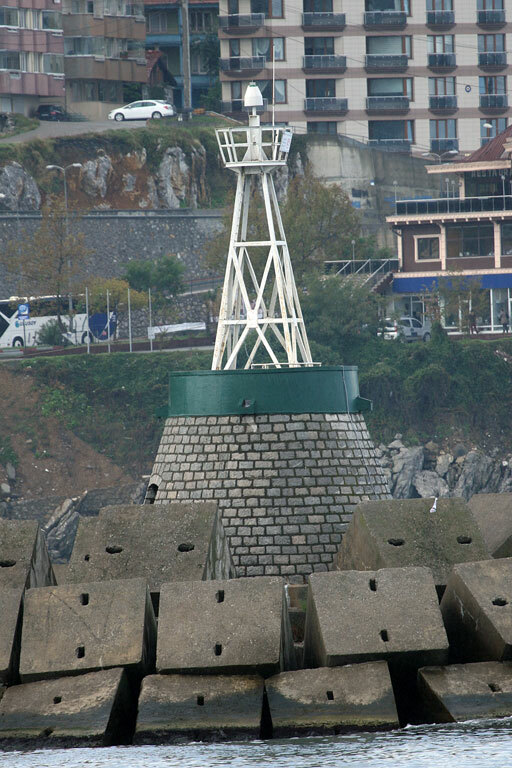 Located at the end of the west breakwater of Zonguldak harbor. Site status unknown. TR-10430; Admiralty N5823.6; NGA 19620. 2002. Active; focal plane 19 m (62 ft); red flash every 5 s. 12 m (39 ft) square skeletal tower mounted on a round, truncated conical stone tower. The tower is unpainted except the concrete gallery rail is painted red. Trabas has a photo, and Google has a satellite view and a distant street view. Huelse has a historic postcard view of an earlier light at this harbor entrance. 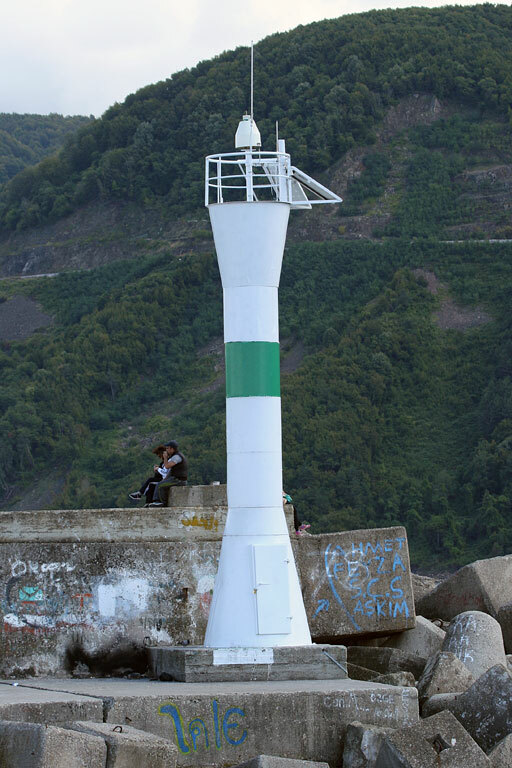 Located at the end of the north breakwater of Zonguldak harbor. Site status unknown. TR-10420; Admiralty N5823.5; NGA 19624. 1920s (station established 1908). Active; focal plane 53 m (174 ft); white flash every 5 s. 9 m (30 ft) round masonry tower with lantern and gallery, attached to the seaward side of a 1-story keeper's house. Lighthouse painted white. Lokman Önsoy's photo is at right, Trabas has a photo, Mehmet Kart has a 2018 closeup photo, the lighthouse appears on a postage stamp, and Bing has a satellite view. The keeper's house is in use as a restaurant. Turkish Wikipedia has a view of the town from the lighthouse, possibly taken from an adjacent city park. The original lighthouse was a wood tower. Zonguldak Province is Turkey's leading coal-mining area, although production has declined in recent years. 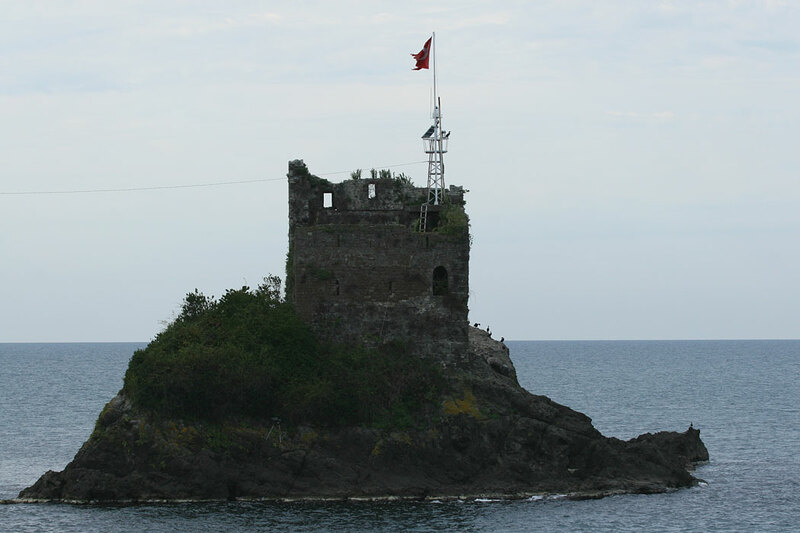 Located on a high promontory at the northeast entrance to Zonguldak harbor. Site open, restaurant open daily, tower closed. ARLHS TUR-057; TR-10410; Admiralty N5820; NGA 19608. 1965. Active; focal plane 70 m (230 ft); two white flashes every 6 s. 10 m (33 ft) round cylindrical concrete tower with gallery. Entire lighthouse is unpainted white concrete. Trabas has a photo, Bash has a Coastal Safety Directorate photo (1/3 the way down the page), and the lighthouse is seen in a Google satellite view. Located on a promontory on the south side of Bartın harbor, 12 km (7.5 mi) northwest of the city. Site and tower closed. TR-10394; Admiralty N5818.4; NGA 19588. 1965. Active; focal plane 10 m (33 ft); three green flashes every 10 s. 8 m (26 ft) round cylindrical concrete tower with gallery. Entire lighthouse is unpainted white concrete. Bash has a Coastal Safety Directorate photo (1/3 the way down the page), and the lighthouse is seen in a Google satellite view. 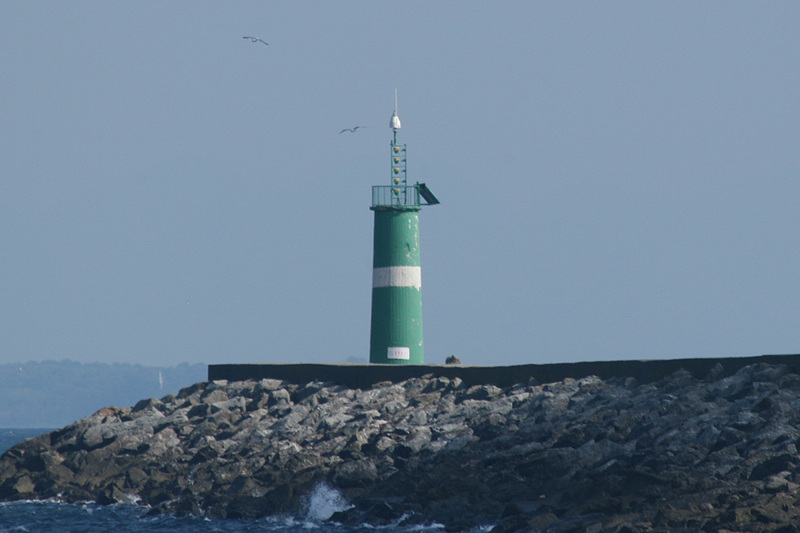 Located at the end of the south breakwater of Bartın harbor. Site and tower closed. TR-10396; Admiralty N5818.6; NGA 19596. 1965. Active; focal plane 10 m (33 ft); two red flashes every 5 s. 7 m (23 ft) round cylindrical concrete tower with gallery. 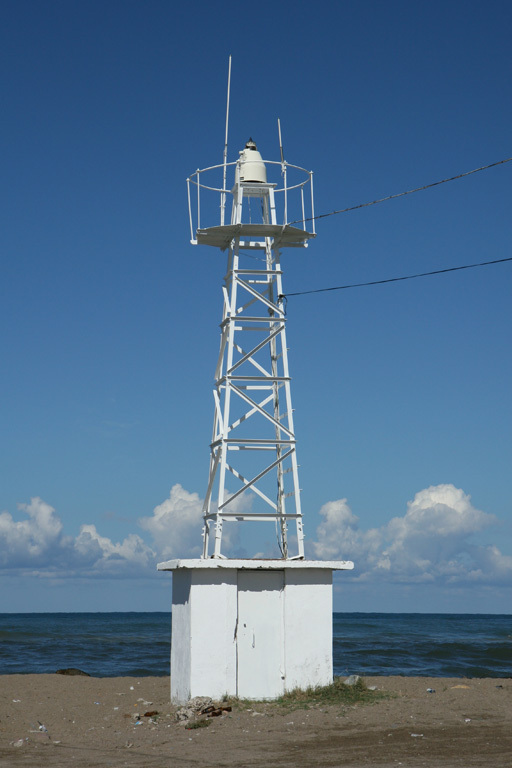 The lighthouse is unpainted white concrete with two narrow red horizontal bands. 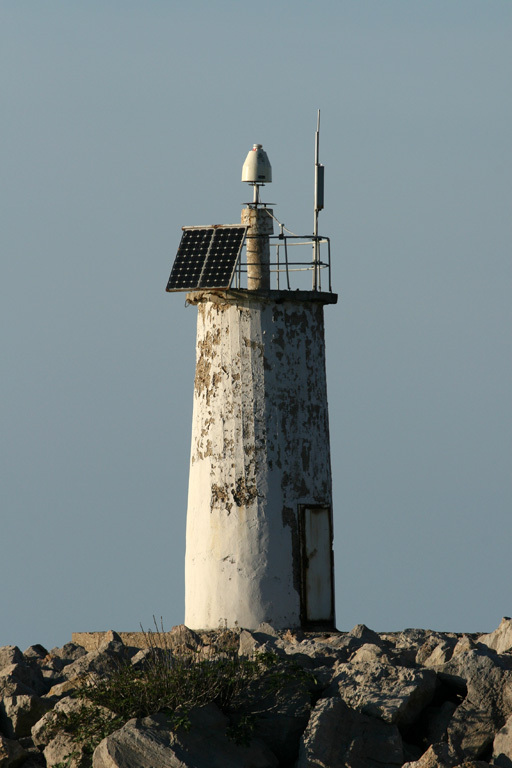 Trabas has a photo, and the lighthouse is seen in a Google satellite view. Located at the end of the north breakwater of Bartın harbor, 12 km (7.5 mi) northwest of the city. Site and tower closed. TR-10395; Admiralty N5818.5; NGA 19592. 1863. Active; focal plane 77 m (253 ft); white flash every 10 s. 7.5 m (25 ft) lantern mounted at the seaward end of a 1-story masonry keeper's house. 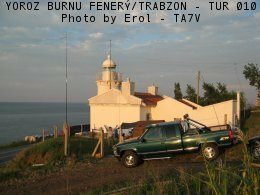 A 2008 photo is at right, Trabas has a photo, Murat Tarman has a 2015 photo, Mert Sezer has a 2017 street view, and the lighthouse is seen in a Google satellite view. 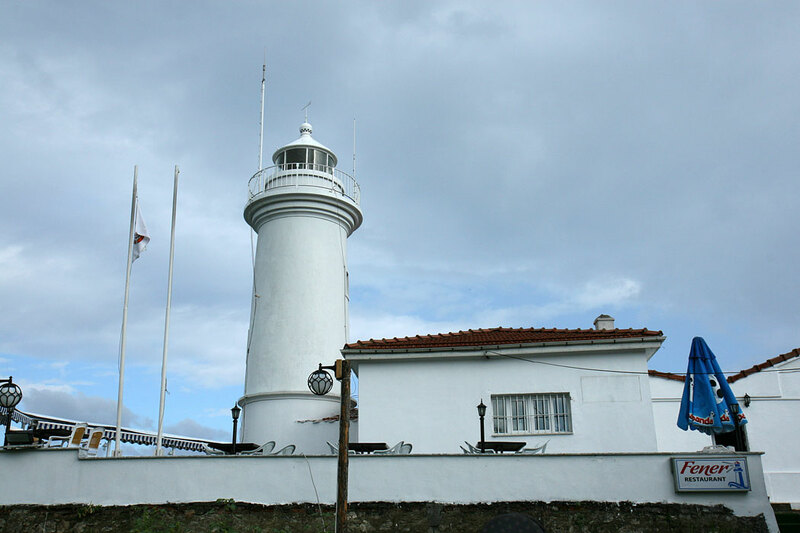 This light is a sibling of the Sinop lighthouse. Amasra is a small port about 15 km (9 mi) northeast of the city of Bartın. 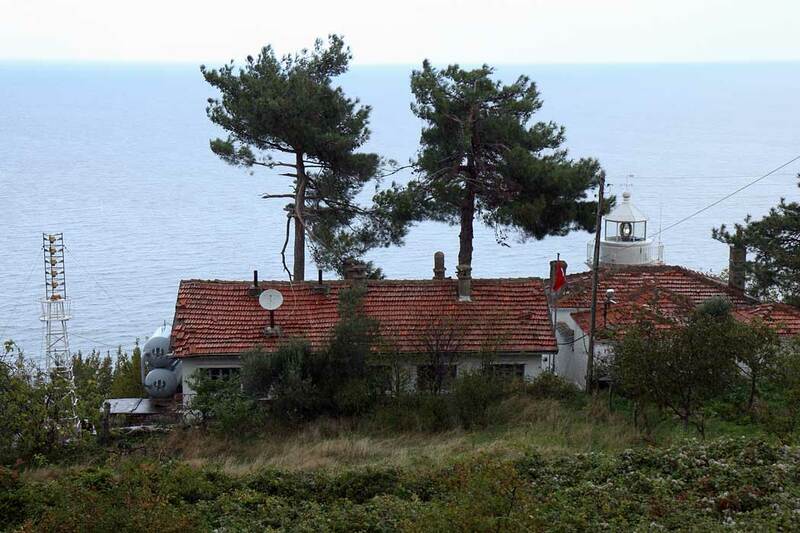 Located atop a cliff on the north side of a steep-sided island northwest of Amasra harbor. Site status unknown. Admiralty N5817; NGA 19576. 1961. 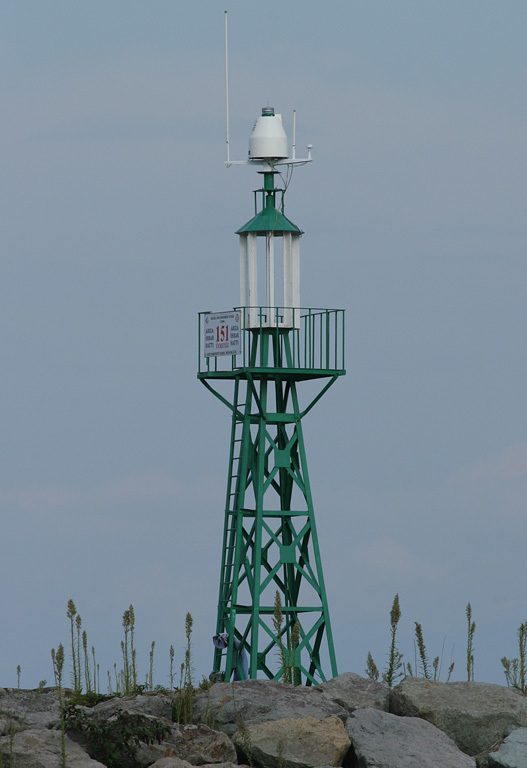 Active; focal plane 14 m (46 ft); green flash every 6 s. 10 m (33 ft) round hourglass-shaped steel tower, painted white with a narrow green horizontal band. Trabas has a photo, Safek Tortu has a photo, and Google has a satellite view. Located at the end of the north breakwater; accessible by walking the mole. Site open, tower closed. Admiralty N5817.5; NGA 19584. 1961. 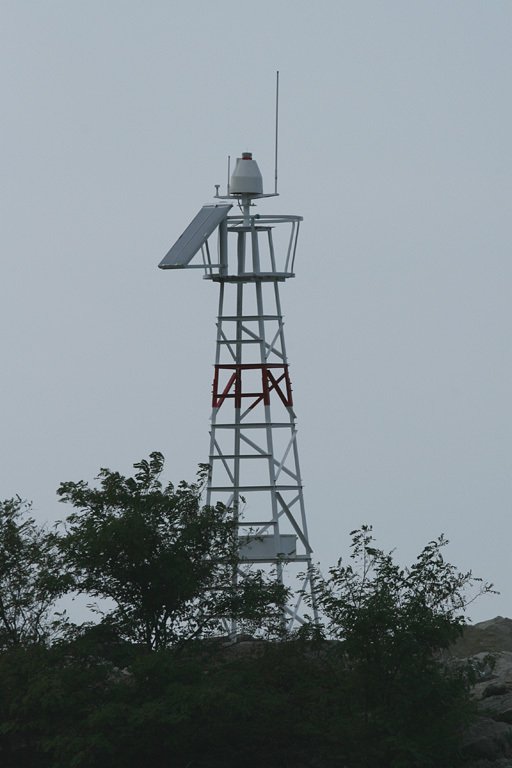 Active; focal plane 14 m (46 ft); red flash every 6 s. 10 m (33 ft) round hourglass-shaped steel tower, painted white with a narrow red horizontal band. Trabas has a photo, another photo is available, and Google has a satellite view. Located at the end of the south (really the east) breakwater. Site and tower closed. Admiralty N5818; NGA 19580. 1963. Active; focal plane 41 m (135 ft); white flash every 3 s. 8 m (26 ft) round white concrete tower. Trabas has a photo, and Google has a satellite view. Located on a promontory just west of the harbor of Kurucaşile. Site open, tower closed. TR-10377; Admiralty N5816.7; NGA 19572. Date unknown. Active; focal plane 9 m (30 ft); green flash every 5 s. 8 m (26 ft) round cylindrical concrete tower, painted white with a narrow green horizontal band. Trabas has a photo, M. Feyzi Yaman has a view from the north breakwater, and Google has a satellite view and a distant street view. Located on the south breakwater at Cide. Accessible by walking the pier. Site open, tower closed. Admiralty N5816.6; NGA 19568. 1885. Active; focal plane 82 m (269 ft); one long (2 s) white flash every 20 s. 8 m (26 ft) round stone tower attached to the front of a 1-story stone keeper's house. Entire lighthouse painted white. 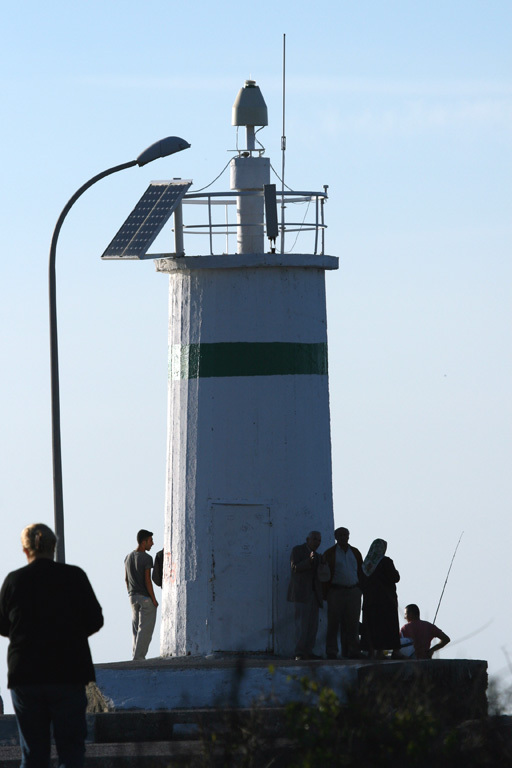 A photo by İsmail Refik Görgülü is at right, Trabas has a photo, a 2016 closeup photo is available, Nuh Muhammed Uruk also has a closeup, the lighthouse appears on a postage stamp, and Google has a street view and a satellite view. This lighthouse is on a mountainous cape, at the top of a cliff about 250 m (800 ft) from the shore. Located about 8 km (5 mi) west of Doğanyurt. Accessible by road. Site apparently open, tower closed. ARLHS TUR-007; TR-10370; Admiralty N5816; NGA 19556. Date unknown (station established 1863). Active; focal plane 38 m (125 ft); white flash every 10 s. 9 m (30 ft) round cylindrical concrete tower with gallery and four ribs. Entire lighthouse is white. Trabas has a closeup photo, Bash has a Coastal Safety Directorate photo (nearly halfway down the page), and Google has a distant satellite view. Located on a promontory overlooking the harbor of İnebolu. Site status unknown. TR-10330; Admiralty N5812; NGA 19544. Note: Sinop (Sinope) has been a Black Sea port for at least 3000 years; it has one of the few naturally protected harbors on Anatolia's north coast. The city today has a population of about 40,000. 1963. Active; focal plane 29 m (87 ft); white flash every 5 s. 6 m (20 ft) square pyramidal skeletal tower mounted atop a square 1-story concrete equipment room. Trabas has a photo, but Google has only a fuzzy satellite view. Located on a prominent cape at Çaylıoğlu, about 8 km (5 mi) west of Ayancık. Site status unknown. TR-10320; Admiralty N5811; NGA 19536. 1863. Active; focal plane 26 m (85 ft); four white flashes every 20 s. 12 m (39 ft) masonry tower with lantern and gallery, attached to a 1-story masonry keeper's house. The upper portion of the tower is octagonal and the lower portion is square. Entire lighthouse painted white. Three additional keeper's houses or other light station buildings. A photo by Nurettin Mert Aydin is at right, Trabas has a photo, Kerim Arli has a good 2007 photo, Tolga Davaz has a street view, and Google has a satellite view of the station. 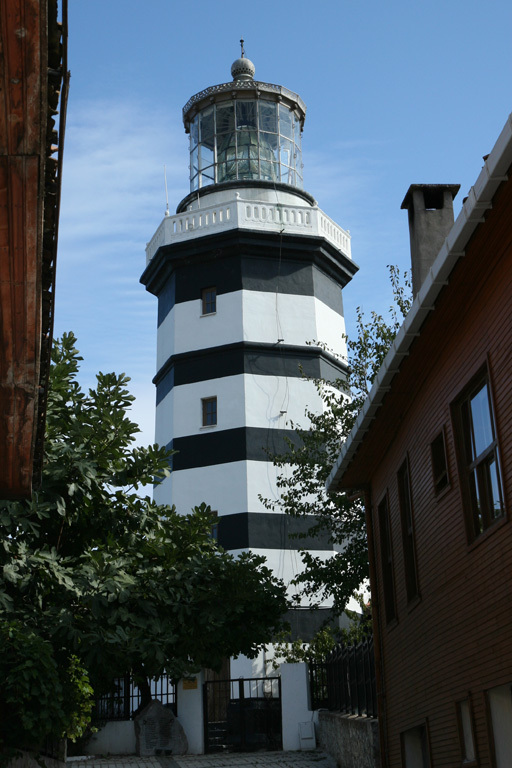 This lighthouse stands on the northernmost point of Turkey. Note: Turkey has several other lights named İnce Burun (Sharp Cape). Located on the point of the cape, about 25 km (15 mi) west northwest of Sinop. Accessible by road; parking provided. Site open, tower closed. ARLHS TUR-005; TR-10310; Admiralty N5810; NGA 19532. 1863. 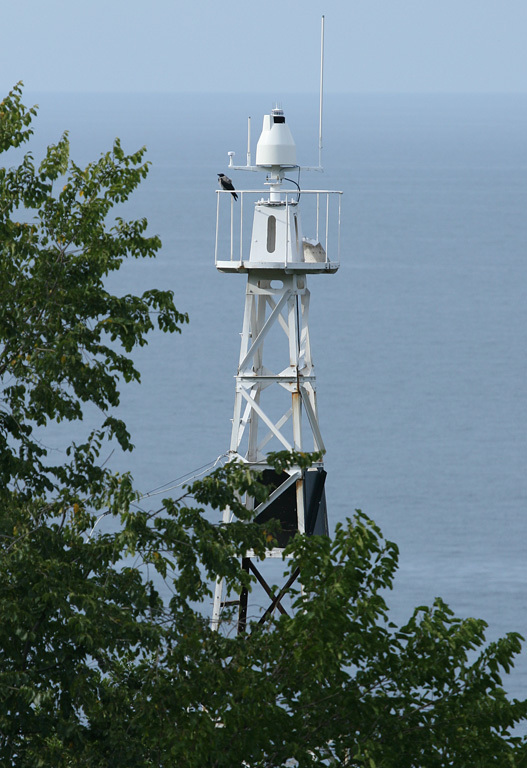 Active; focal plane 107 m (351 ft); two white flashes every 15 s. 4 m (13 ft) lantern mounted on a concrete pedestal and attached to the seaward side of a small 1-story concrete keeper's house. Entire lighthouse is white. Trabas has a photo, Bash has a Coastal Safety Directorate photo (halfway down the page), Tolga Davaz has a street view, and Google has a satellite view. This might be the original lighthouse covered by stucco. Boztepe Burnu is a promontory, shaped rather like a turkey's head, that protects the harbor of Sinop, one of the oldest ports of Turkey's Black Sea coast. Located at the tip of the promontory. Accessible by road. Site status unknown. TR-10290; Admiralty N5808; NGA 19512. 1944. Active; focal plane 15 m (49 ft); two white flashes every 3 s. 6 m (20 ft) round concrete tower with double gallery and four ribs. 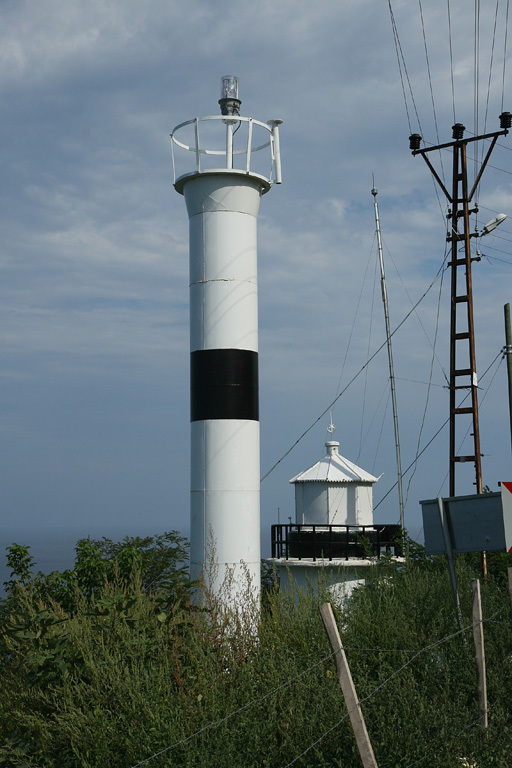 The lighthouse is white with two narrow black horizontal bands. Trabas has a closeup photo, Seyit Ali Eymen has a vety distant street view, and Google has a satellite view. Located on a sharp promontory that shelters the harbor of Gerze, about 25 km (15 mi) south of Sinop. Site open, tower closed. TR-10280; Admiralty N5807; NGA 19508. 1880. 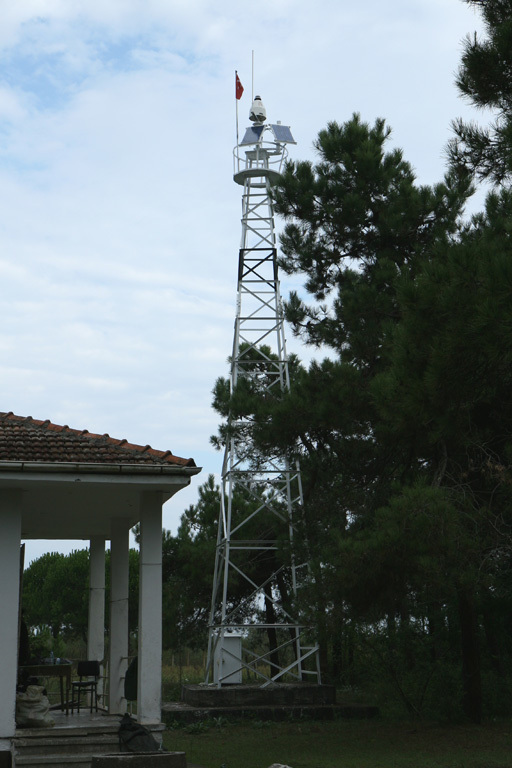 Active; focal plane 25 m (82 ft); white flash every 5 s. 23 m (75 ft) hexagonal pyramidal cast iron skeletal tower with lantern, gallery, enclosed 2-story watch room, and central cylinder. 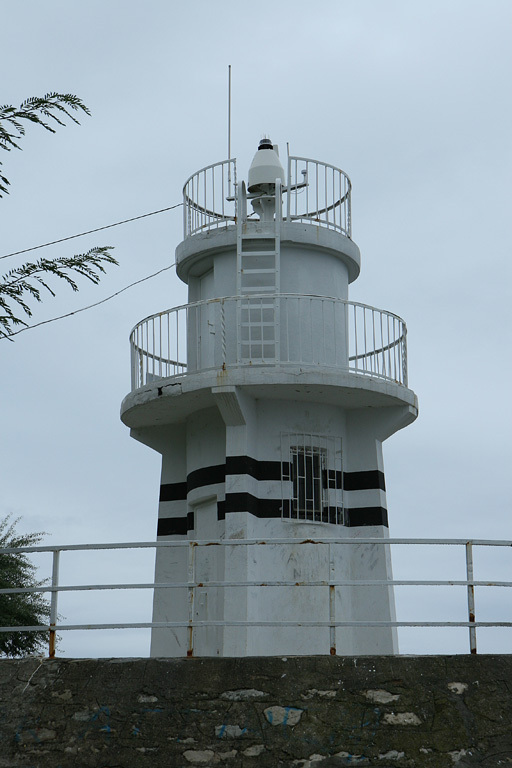 Lighthouse painted white with one black horizontal band. This is a staffed station, and the keepers must wind the rotating mechanism every 3 hours. Hasan İlem's photo is at right, Trabas has a good photo, Utku Kavruk has a February 2018 photo, and Google has a good satellite view. 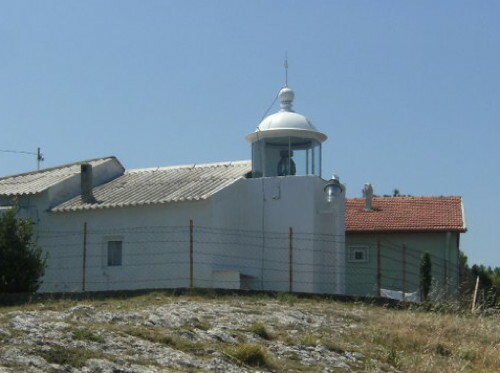 The lighthouse was prefabricated in France. Bafra Burnu is the cape formed by the delta of the Kızılırmak (Irmak or Halys River). Turkey's longest river, the Kızılırmak drains a large part of central Anatolia. Located about 1 km (0.6 mi) southwest of the river's mouth near Sahilkent, about 20 km (13 mi) north of Bafra. Site apparently open, tower closed. TR-10270; Admiralty N5806; NGA 19496. 2008. Active; focal plane 15 m (49 ft); three white flashes every 12 s. 12 m (39 ft) square pyramidal skeletal tower, painted white. Trabas has a photo, and Google has a satellite view. Located on the beach about 50 km (30 mi) northwest of Samsun. Site status unknown. TR-10260; Admiralty N5805; NGA 19492. 2008 (station established 1863). Active (? ); focal plane about 16 m (52 ft); light characteristic, if any, unknown. Approx. 12 m (39 ft) octagonal cylindrical concrete tower with lantern and gallery, attached to a 1-story building. 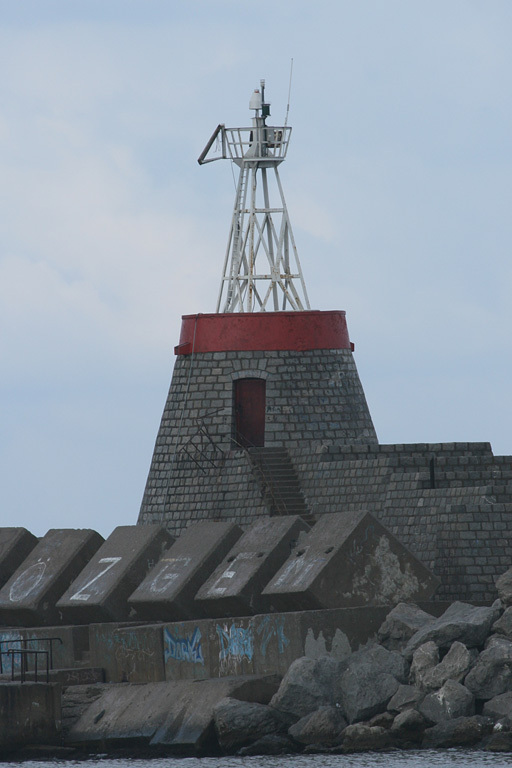 The lighthouse appears to be unpainted white concrete; the lantern roof is red. Nuh Muhammed Uruk has a 2017 photo, and Google has a satellite view. 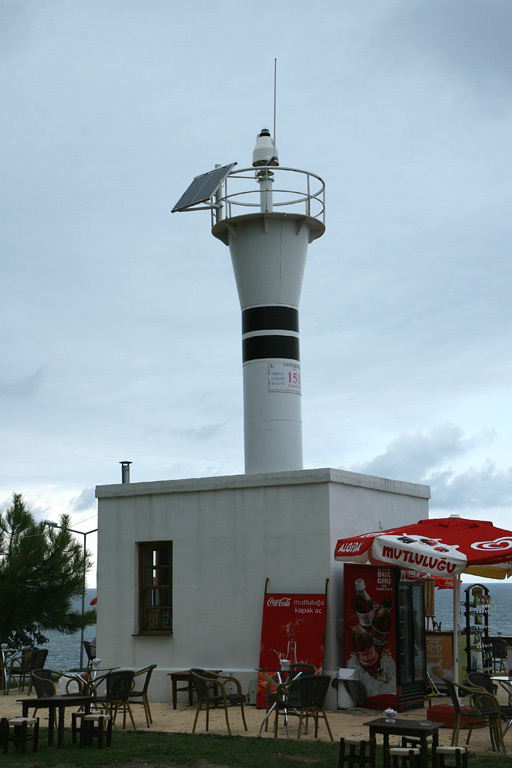 The lighthouse is part of an extensive beach redevelopment project being undertaken by the city of Samsun. The lighthouse appears to be a replica of the original lighthouse as seen in a postcard view posted by Klaus Huelse. That lighthouse disappeared sometime in the 1930s or 1940s. Located near the base of the Samsun North Mole. Site open, tower status unknown. 1959. Active; focal plane 15 m (49 ft); green flash every 2 s. 11 m (36 ft) round concrete tower. 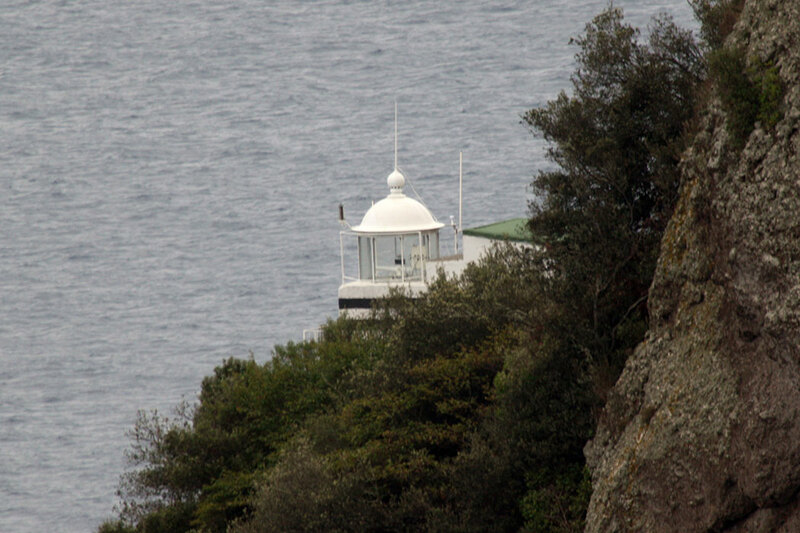 Lighthouse painted green with a narrow white horizontal band. Trabas has a photo, and Google has a satellite view. 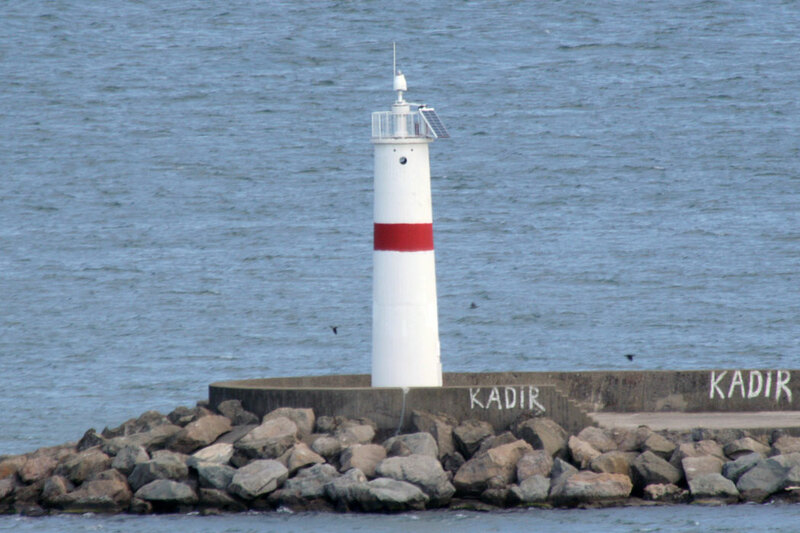 Located at the end of the north mole of Samsun harbor. Site status unknown. TR-10230; Admiralty N5802; NGA 19480. 1959. Active; focal plane 13.5 m (45 ft); red flash every 5 s. 12 m (39 ft) round concrete tower. 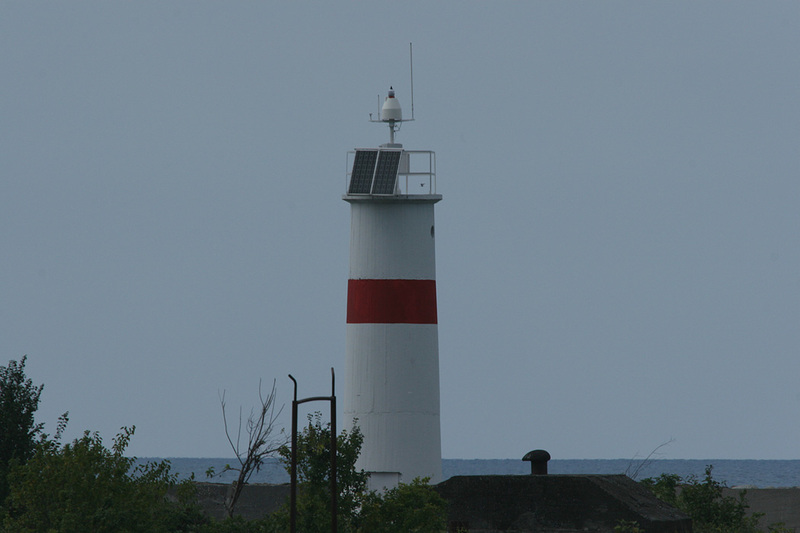 Lighthouse painted white with a narrow red horizontal band. Trabas has a photo showing this color pattern, and Google has a satellite view. 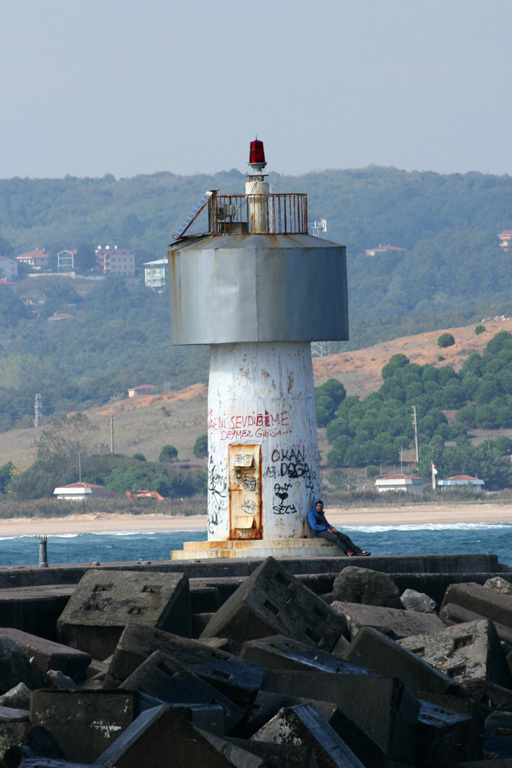 Located at the end of the east mole of Samsun harbor. Site status unknown. TR-10240; Admiralty N5803; NGA 19476. Date unknown (station established 1880). 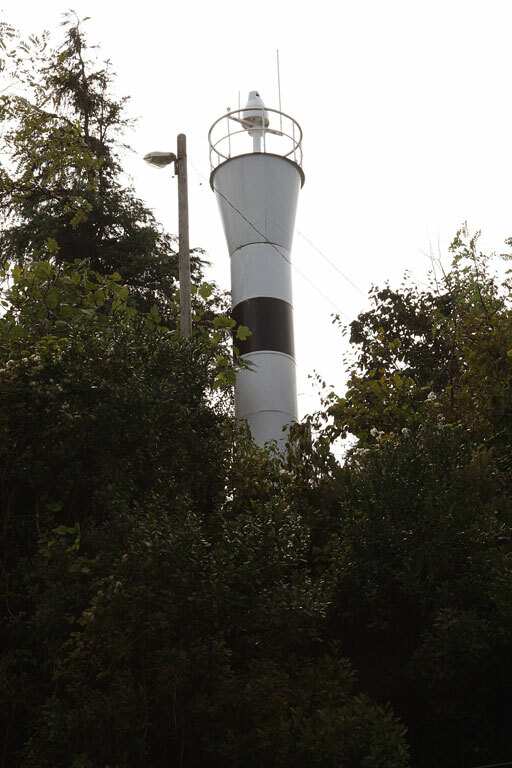 Active; focal plane 23 m (75 ft); two white flashes every 10 s. 18 m (59 ft) round cylindrical concrete tower with gallery, painted white with two narrow black horizontal bands. Trabas has a photo, Bash has a Coastal Safety Directorate photo (2/3 the way down the page), and Google has a satellite view. 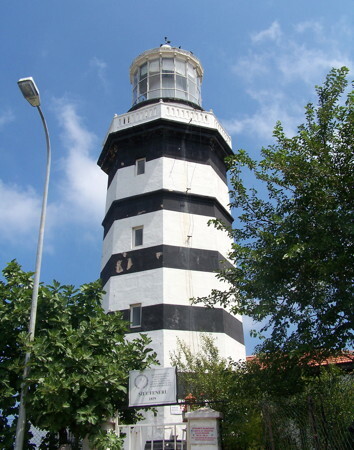 The original light was a skeletal lighthouse, presumably similar to the surviving Bafra Burnu lighthouse (see above). Çiva Burnu (Cape Civa or Cape Mercury) is the wedge-shaped delta of the Yeşilırmak (Iris) River. Presently the river flows into the sea at the point of the cape. 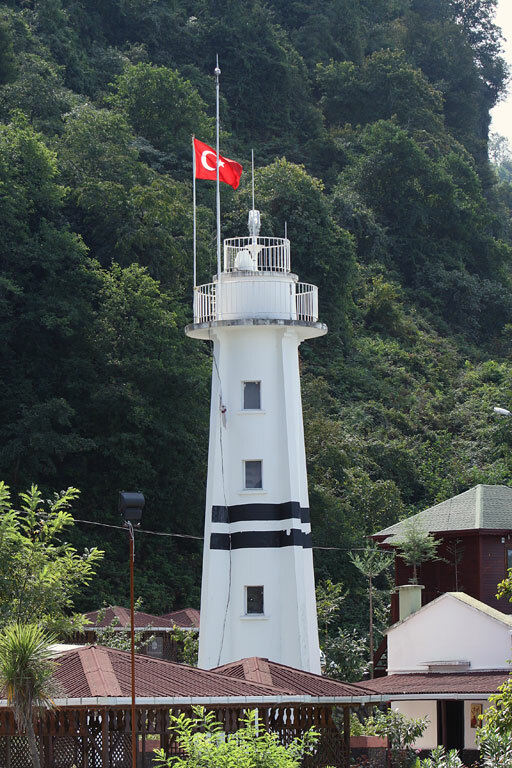 The lighthouse is 2.5 km (1.5 mi) southeast of the river mouth and about 30 km (19 mi) northeast of the city of Samsun. Site status unknown. ARLHS TUR-002; TR-10210; Admiralty N5800; NGA 19468. 1961. Active; focal plane 17 m (56 ft); white flash every 5 s. 15 m (49 ft) square pyramidal skeletal tower, painted white. 1-story keeper's house painted white with a red tile roof. Trabas has a closeup photo, Bash has a Coastal Safety Directorate photo (2/3 the way down the page), and Google has a satellite view. Located on a cape about 7 km (4.5 mi) northeast of Terme. Site status unknown. TR-10200; Admiralty N5799; NGA 19464. Date unknown (station established 1911).Active; focal plane 19 m (62 ft); two white flashes every 6 s. 7.5 m (25 ft) round concrete tower with a flared top, centered on a square 1-story concrete equipment room. 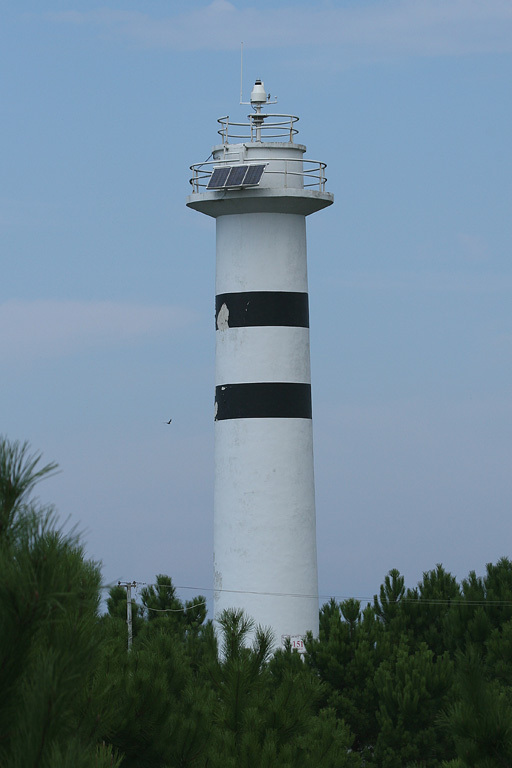 Lighthouse painted white with two narrow black horizontal bands. Trabas has a photo, and Bing has a distant satellite view. 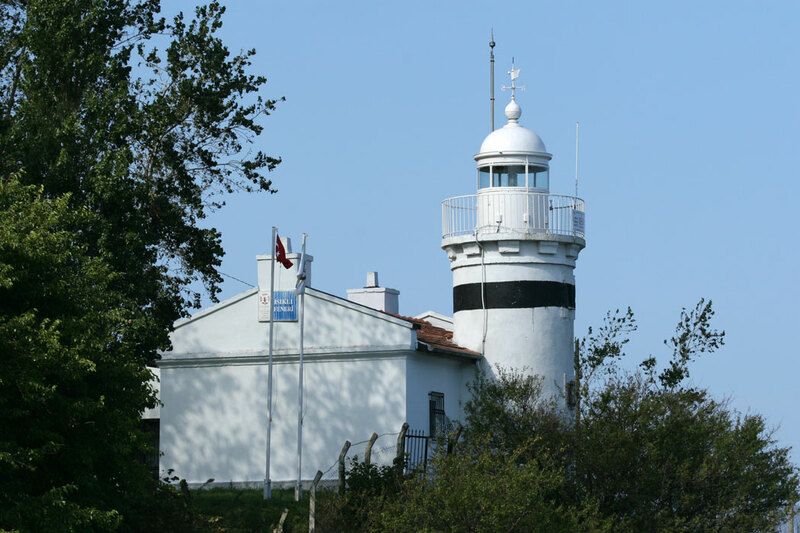 In recent years a café has been built surrounding the lighthouse; Nermin Sağlam has a closeup photo, Kübra Arabacı has another photo, Cihan Odabaşı has an aerial view and Google has a fuzzy satellite view. Located on a promontory sheletering the harbor of Ünye. Site and café open, tower closed. Site manager: Ünye Feneralti Cafe. TR-10190; Admiralty N5798; NGA 19460. 2001. Active; focal plane 13 m (43 ft); green flash every 5 s. 11 m (36 ft) round concrete tower with gallery. 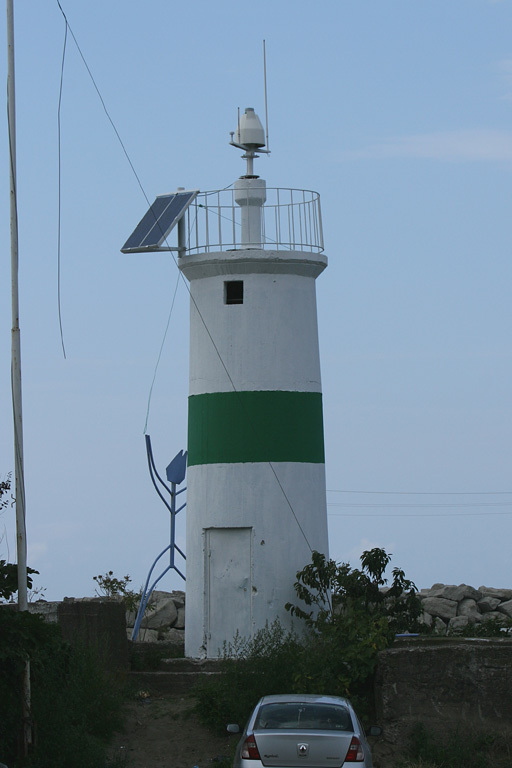 Lighthouse painted white with a narrow green horizontal band. Trabas has a photo, B. Sener has a 2016 photo, and Google has a street view and a satellite view. NGA lists a skeletal tower. Located at the end of the breakwater at Yalıköy, a small port about 12 km (7.5 mi) east of Fatsa. TR-10163.5; Admiralty N5795.35; NGA 19453.1. 2001. Active; focal plane 13 m (43 ft); continuous red light. 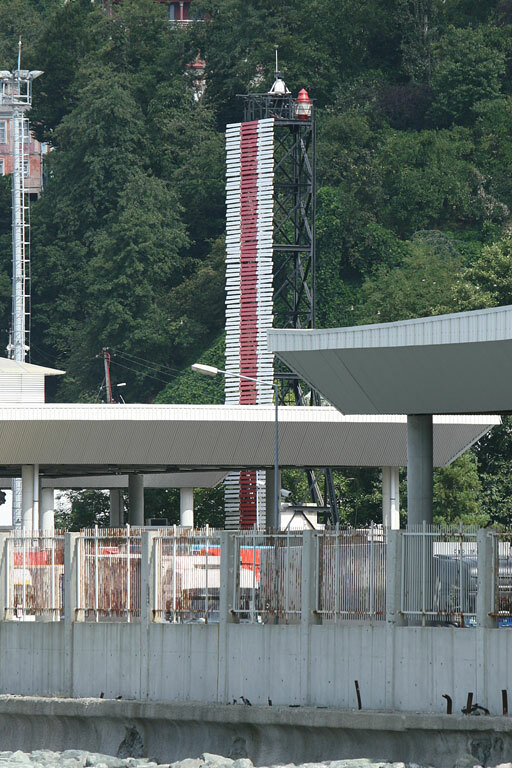 11 m (36 ft) square skeletal tower, painted white with a narrow red horizontal band. Trabas has a photo, and Google has a satellite view. The former light was a concrete tower. Located at the end of the breakwater at Yalıköy, a small port about 12 km (7.5 mi) east of Fatsa. TR-10163; Admiralty N5795.3; NGA 19453. Date unknown. 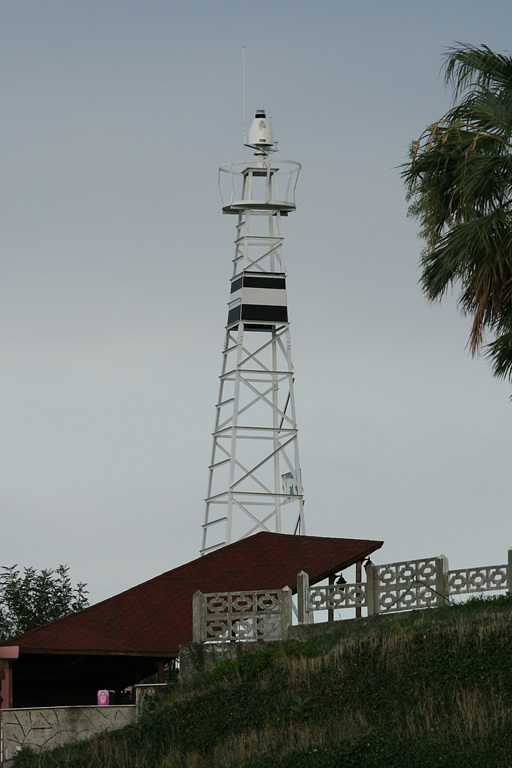 Active; focal plane 11 m (36 ft); three white flashes every 15 s. 7 m (23 ft) round hourglass-shaped tower, white with three narrow black horizontal bands. Trabas has a photo, a Hakan Sungurlu has a photo, Çağlar Koyuncu has a closeup, and Google has a satellite view. NGA lists a skeletal tower here. Located at the tip of a very sharp promontory about 8 km (5 mi) west of Çam Burnu. Site open, tower closed. TR-10160; Admiralty N5795; NGA 19452. 1880. Inactive. 6 m (20 ft) round cylindrical masonry tower with lantern and gallery, painted white. A photo is at right, and Google has a street view and a distant satellite view. 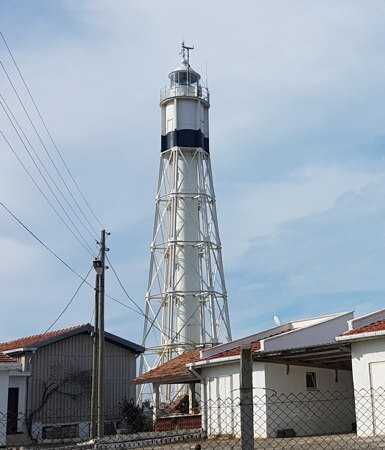 Trabas has a photo of the new light (focal plane 39 m (128 ft); white flash every 10 s) that shows the historic lighthouse still standing. 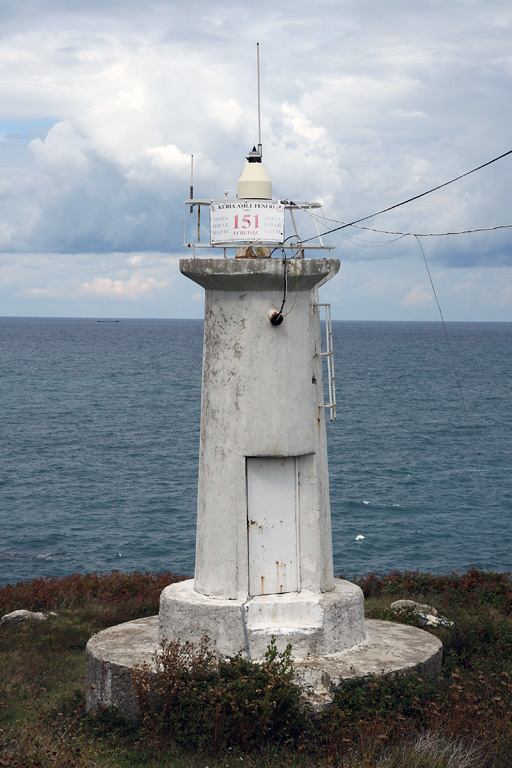 Endangered: Yunus Yavuz has a 2017 photo showing the abandoned lighthouse in poor condition. Çam Burnu (Pine Point) is a common geographical name in Turkey. Located on a prominent cape 5 km (3 mi) north of Perşembe and 25 km (15 mi) northwest of Ordu. Site open, tower closed. ARLHS TUR-067; TR-10150; Admiralty N5794; NGA 19448. Date unknown (station established 1975). 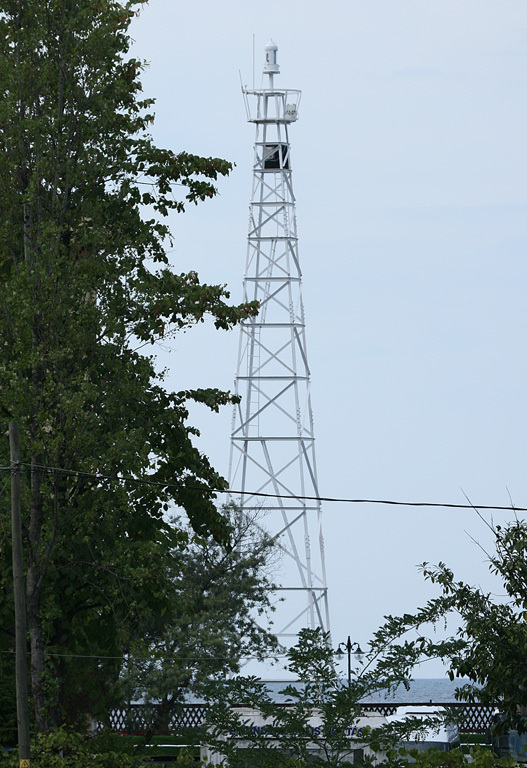 Active; focal plane 30 m (98 ft); white flash every 10 s. 10 m (33 ft) round hourglass-shaped metal tower, painted white with a narrow black horizontal band. Google has only a fuzzy satellite view of the location. Trabas has a photo, and Google has a distant satellite view. Located on a bluff above the harbor of Piraziz, just west of the border between Ordu and Giresun Provinces. Site open, tower closed. TR-10104; Admiralty N5789.4; NGA 19440. Date unknown (station established 1863). Active; focal plane 111 m (364 ft); one long white flash every 15 s. 12 m (39 ft) round hourglass-shaped tower, painted white with a narrow black horizontal band. Trabas has a closeup photo, and Google has a street view and an indistinct satellite view. 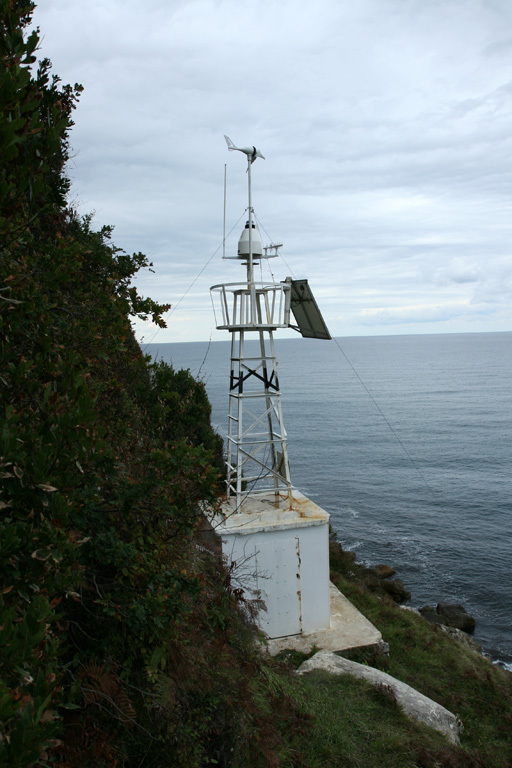 This light replaced a skeletal tower seen in a Coastal Safety Directorate photo (3/4 the way down the page). 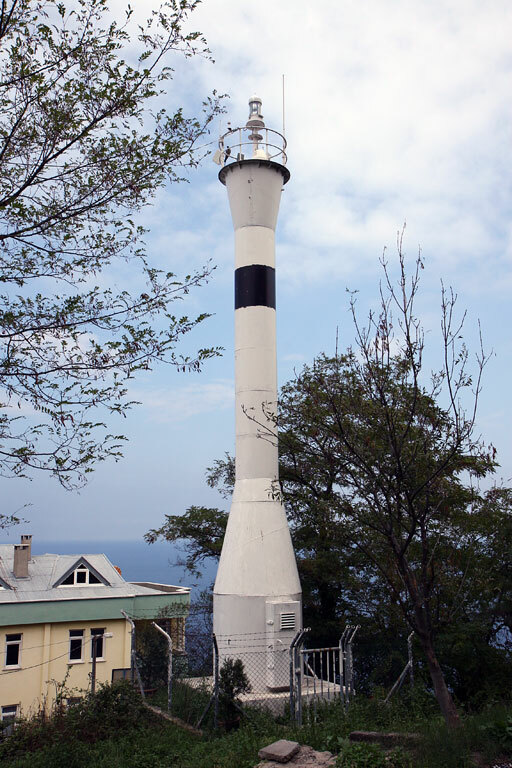 Located on a steep hillside overlooking the base of the breakwater of Giresun. Site open, tower closed. TR-10110; Admiralty N5790; NGA 19428. Date unknown. Active; focal plane 31 m (102 ft); red flash every 4 s. 8 m (26 ft) square skeletal tower painted white. Trabas has a photo. The tower is not seen in Google's satellite view. Located on the wall of the historic fortress overlooking the harbor of the town of Tirebolu. Site open, tower closed. Admiralty N5788; NGA 19420. Date unknown. 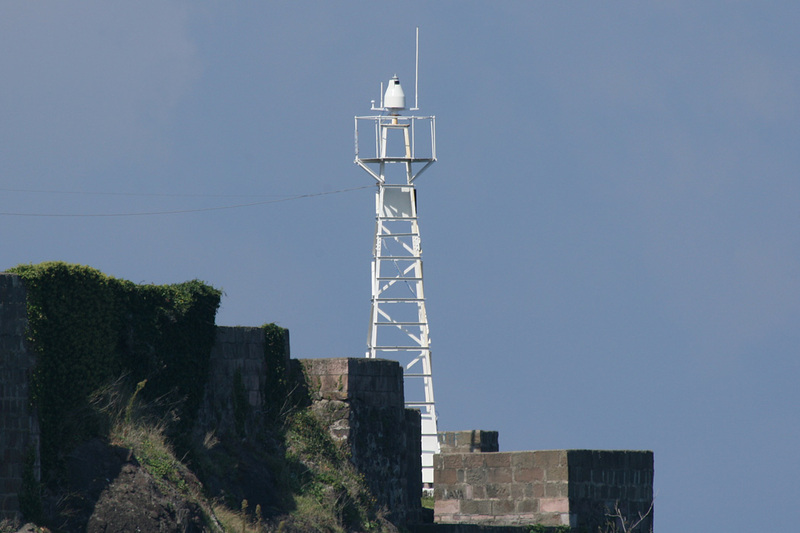 Active; focal plane 30 m (98 ft); white flash every 10 s. 8 m (26 ft) round barbell-shaped tower, colored white with one narrow black horizontal band. Hasan Polat has a November 2017 photo. 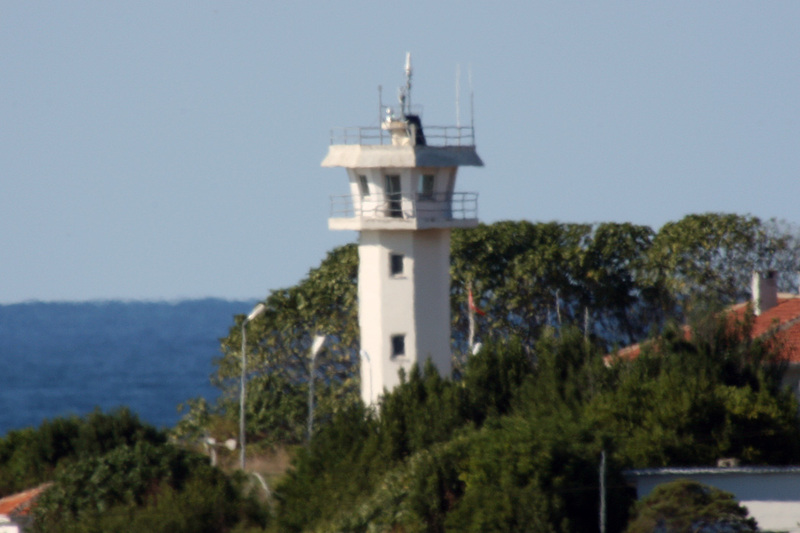 Trabas has a photo of the original lighthouse, a 7 m (23 ft) skeletal tower, and Google has a street view showing the tower within the walls of the historic Eynesil fortress. Google has a satellite view of the fortress. Located on a prominent cape about 3 km (2 mi) northeast of the town of Eynesil. Site open, tower closed. ARLHS TUR-069; TR-10085; Admiralty N5787.5; NGA 19412. 1886. Active; focal plane 25 m (82 ft); white flash every 10 s. 8 m (26 ft) round cylindrical stone tower, rising from the front of a 1-story keeper's house. 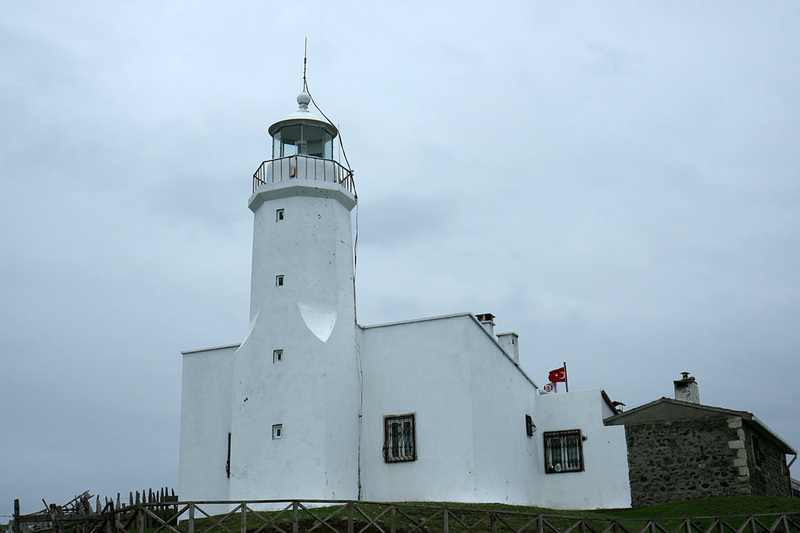 Lighthouse painted white with one narrow black horizontal band; the house has a red tile roof. Trabas has a photo, Nuh Muhammed Uruk has a 2017 photo of the lighthouse in action, Ted Sarah also has a small photo, Google has a street view, and Bing has a satellite view. Located on Yoroz Burnu (Cape Yoroz), a very prominent headland about 13 km (8 mi) northeast of Vakfikevir and about 35 km (22 mi) west of the city of Trabzon. Site status unknown. ARLHS TUR-010; TR-10070; Admiralty N5786; NGA 19408. Date unknown (station established 1863). 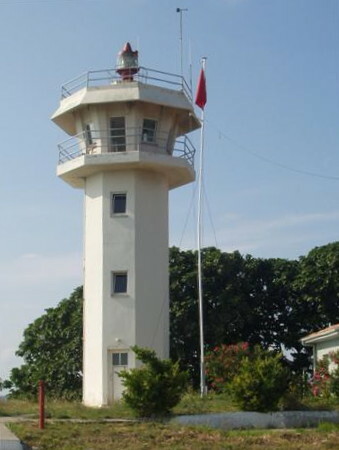 Active; focal plane 31 m (102 ft); two white flashes every 15 s. 6 m (20 ft) square skeletal tower with a small lantern and gallery, painted white; lantern dome painted red. Trabas has a closeup photo, Cem Gençer has a view from the sea, F. Dominik has a street view, and Bing has an indistinct satellite view. 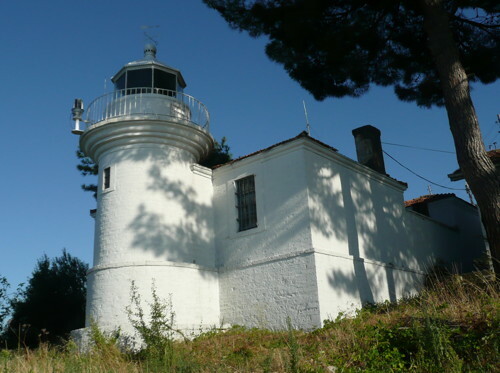 The original lighthouse was a short masonry tower attached to a keeper's house, very similar to the surviving Sinop lighthouse (see photo below). The light stands in front of the historic citadel (güzelhisar) of Trabzond. Located on a promontory a short distance west of Trabzond harbor. Site status unknown. TR-10050; Admiralty N5784; NGA 19388. 1969. Active; focal plane 35 m (115 ft); white flash every 5 s. 12 m (39 ft) square pyramidal skeletal tower with gallery; a section in the center of the tower is enclosed. The lighthouse is unpainted gray metallic. A photo is at right, Trabas has a photo, and Bing has a distant satellite view. Located on a prominent cape about 3 km (2 mi) northwest of Araklı. This is just off the coastal highway, but the site status is unknown. Admiralty N5783; NGA 19384. Date unknown. Active; focal plane 10 m (33 ft); green flash every 5 s. 9 m (30 ft) square pyramidal skeletal tower with gallery and an enclosed lower section. Lighthouse painted green. Trabas has a photo, and Google has a satellite view and a distant street view. 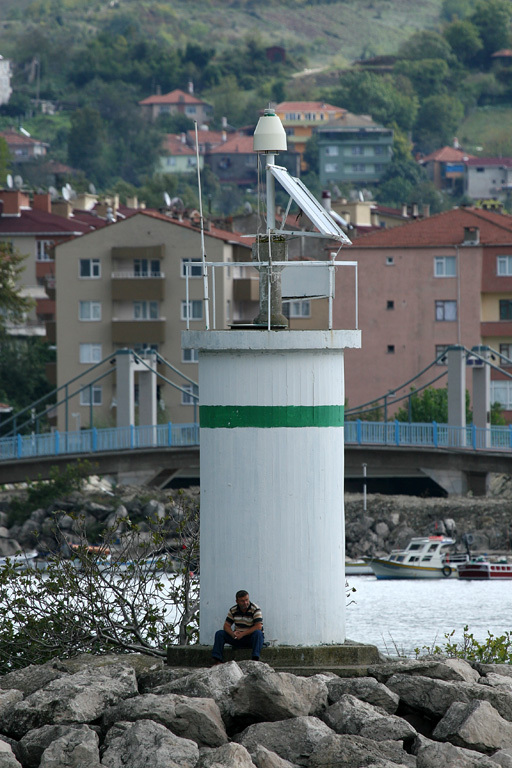 Located at the end of the north (outer) breakwater at Araklı. This pier may not be walkable. Site open, tower closed. Admiralty N5782.9; NGA 19385. Date unknown. Active; focal plane 10 m (33 ft); red flash every 5 s. 9 m (30 ft) square pyramidal skeletal tower with gallery and an enclosed lower section. Lighthouse painted red. Trabas has a photo, and Google has a street view and a satellite view. 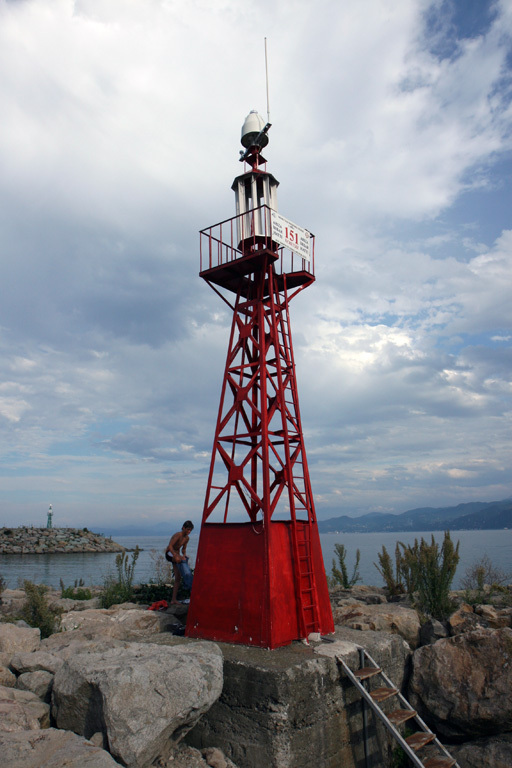 Located at the end of the south (inner) breakwater at Araklı. Accessible by walking the pier. Site open, tower closed. TR-10042; Admiralty N5782.95; NGA 19385.5. Date unknown (station established 1884). Active; focal plane 22 m (72 ft); white flash every 5 s. 18 m (59 ft) square pyramidal skeletal tower with gallery; there is a square 1-story concrete equipment room sheltered by the base of the tower. Entire lighthouse painted white. Trabas has a photo, and Bing has a satellite view. Located on a bluff overlooking the harbor of Rize. Site status unknown, but since the tower is close to the coastal road it should be easy to spot. TR-10034; Admiralty N5782; NGA 19368. Date unknown. Active; focal plane 16 m (52 ft); white flash every 5 s. 11 m (36 ft) square skeletal tower, painted white, mounted on a square stone watchtower. Previously in a ruined state, the tower has been restored recently. Google has a 2015 street view, Ahmet Akay has a 2015 photo, and Trabas has a photo, but Google has only a fuzzy satellite view. Kız Kulesi means Maiden's Tower; there is a famous lighthouse by that name at İstanbul (see Northwestern Anatolia). Located on a rocky reef just off a promontory on the west side of Pazar. Site open, tower closed. Admiralty N5781; NGA 19364. 1980 (station established 1935). 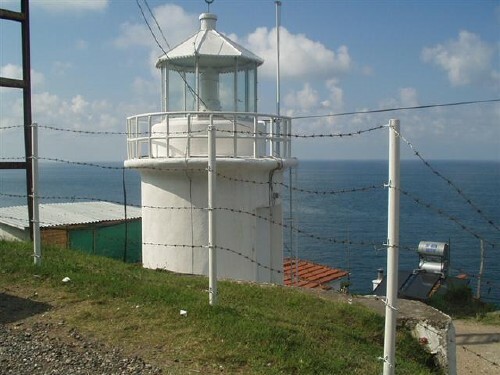 Active; focal plane 23 m (75 ft); two white flashes every 15 s. 12 m (39 ft) round cylindrical concrete tower with gallery and four ribs; no lantern. Two 1-story keeper's houses. 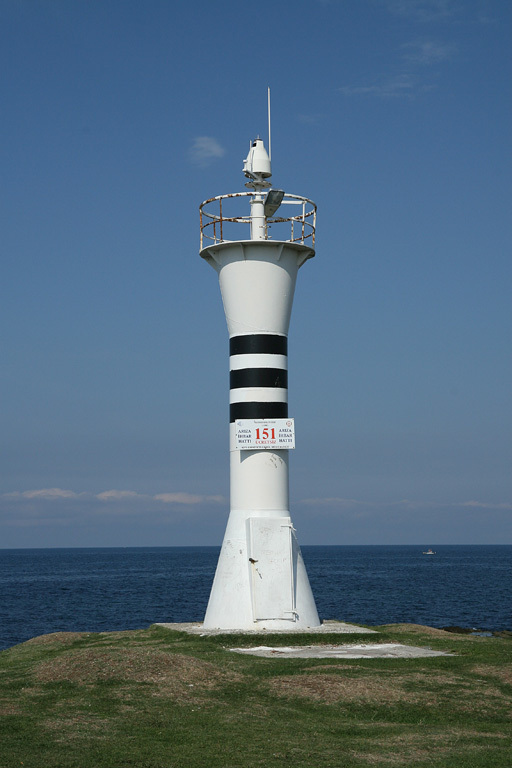 The lighthouse is white with two narrow black horizontal bands. An older photo is at right. More recently a café has been built next to the lighthouse. Trabas also has a photo, Ümit Işikaltun has a 2017 photo, and Google has a street view and a satellite view. Located beside the coastal highway, on a headland about 4 km (2.5 mi) northeast of Arhavi and 12 km (7.5 mi) southwest of the town of Hopa. Site open, tower closed. Site manager: Kurdoğlu Fener Restoran. ARLHS TUR-016; TR-10010; Admiralty N5780; NGA 19352. 1973. Active; focal plane 14 m (46 ft); red flash every 3 s. 8.5 m (28 ft) round concrete tower with gallery. Entire lighthouse is white. Trabas has a photo, and Google has a satellite view and a distant street view. Located at the end of the inner (east) breakwater of Hopa, Turkey's easternmost Black Sea port. Site status unknown. TR-10016; Admiralty N5780.6; NGA 19360. 1980. Active; focal plane 33.5 m (110 ft); white light occulting once every 4 s. 20 m (66 ft) square cylindrical steel skeletal tower, painted black. The seaward side of the pylon carries a 6 m (20 ft) wide slatted daymark, painted white with a red vertical stripe on the range line. Trabas has a photo, and Google has an indistinct satellite view and a very distant street view by Archili Skhvediani. 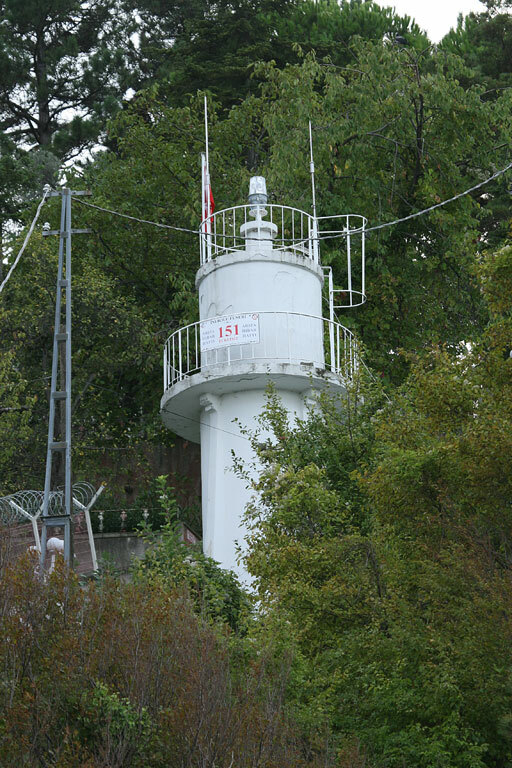 These range lights were built following an agreement between Turkey and the Soviet Union establishing the boundary between the two countries' 12-mile territorial waters; the range line lies along this sea boundary. The rear light is just on the Georgian side of the border and is listed under Georgia. Sarp is a town on the border. Located just a few feet from the Georgian border near the waterfront. Site status unknown. ARLHS TUR-071; TR-10000; Admiralty N5779; NGA 19344. Posted April 16, 2007. Checked and revised May 17, 2018. Lighthouses: 47. Site copyright 2018 Russ Rowlett and the University of North Carolina at Chapel Hill.